The feeds owe their success to the Egyptians and Libyans whose words are carried by them…and the desire of many, many others to hear them. Sometimes at great personal risk they share what they see, think, and fight for. The feeds are collaborative and trust-based: a low-bandwidth conduit for their voices. Can you get around an internet shutdown? I struggled with this question on January 27th when the Egyptian Government shut down the internet. In frenetic collaboration with friends, acquaintances and trusted contacts in Egypt we built @jan25voices in a few hours and began making cellphone and landline calls, then tweeting what we heard. Working nearly 24/7 we kept up a steady flow of tweeted updates from the ground, as well as updates on what was appearing in Arabic-language print and TV news. It was one of the few windows into what was happening in many places in Cairo during the internet shutdown. Tweets aren’t great for context and the voices of the sources stood out in their earnestness, hope and bravery. I began posting audio of the calls to Twiturm. Within a week the audio had been listened to more than 4 million times. The traffic spike crashed Twiturm’s servers. Twice. The @jan25voices feed, at around 10k followers, is mostly quiet (as of November 2011), its function already served. It sometimes comes alive, team-tweeted by Egyptians on the ground during important events, like the first day of Mubarak’s Trial. Gaddafi shut down the internet in Libya and I realized that the @jan25voices model could be adapted for the Libyan uprisings. I reached out to the remarkable duo of Sarah Abdurrahman (also of NPR’s On the Media) and her husband Abdulla Darrat. Working punishing schedules we built @feb17voices on the same model, tweeting and posting calls’ audio. Many others contributed contacts or helped make phone calls. In the first days of the Libyan uprising we shared the voices of brave, scared and very committed Libyans. * We posted in English, Arabic, and Arabic with English voice overs provided by Abdulla and Sarah. 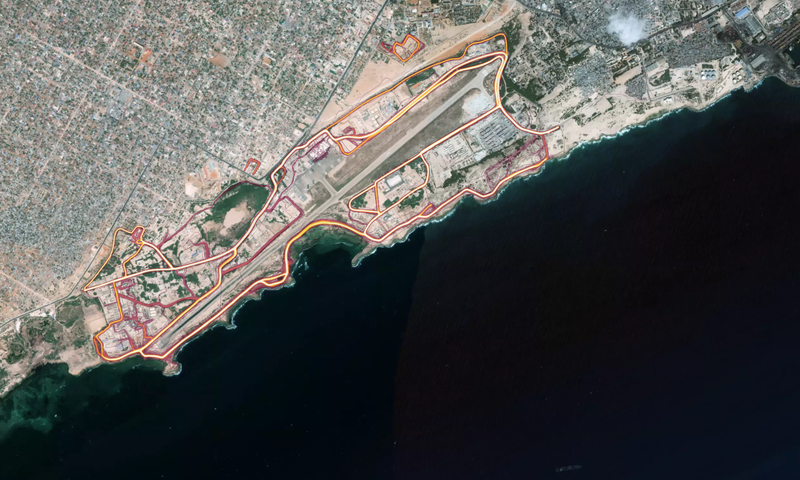 ** The audio recordings and tweets continued, and our coverage evolved: when the media showed up in Benghazi, we refocused Westwards on areas where conflict still raged. I am especially proud of our work providing daily updates and voices from the Siege of Misrata, Fighting in the Western Mountains (Jebel Nafusa where we included some Live Phone Calls in Amazigh), the Battle for Tripoli and the final siege of Sirte. The feed was supplemented by dedicated volunteers watching Aljazeera Arabic and Al Arabiya coverage for Libya, a subset of which we translated and tweeted to help provide context to non-Arabic speakers. The feed is live and has 9k + followers, however it has quieted now that journalists have the full run of Libya. @feb17voices and @jan25voices content was widely cited, linked to, embedded and occasionally broadcast directly. In specific cases I also uploaded Youtube video sent out of Libya via @feb17voices sources, or provided it as exclusives to news organizations like AlJazeera. 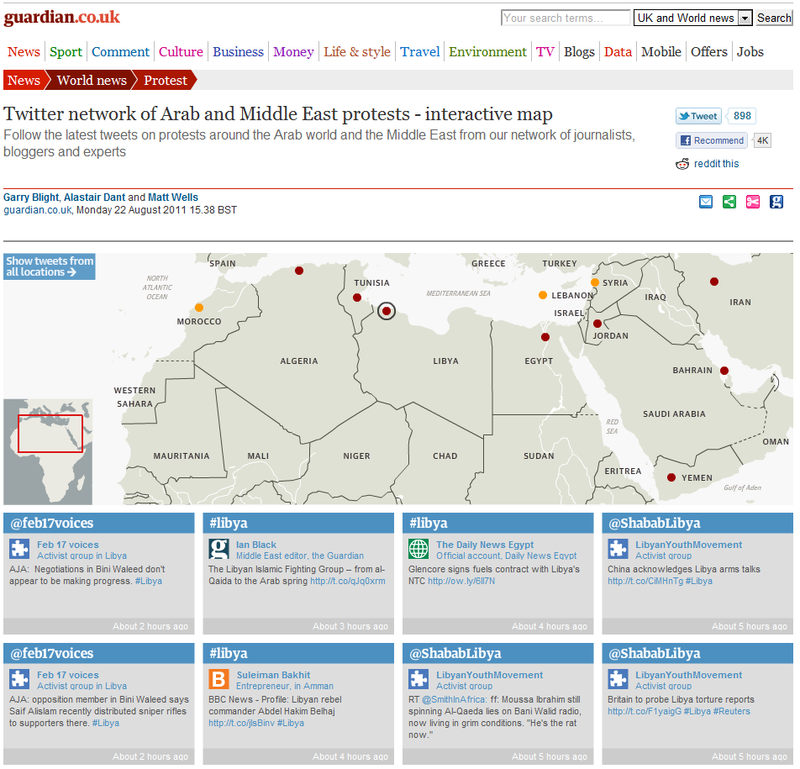 It was often featured on event-specific Live Blogs (e.g. 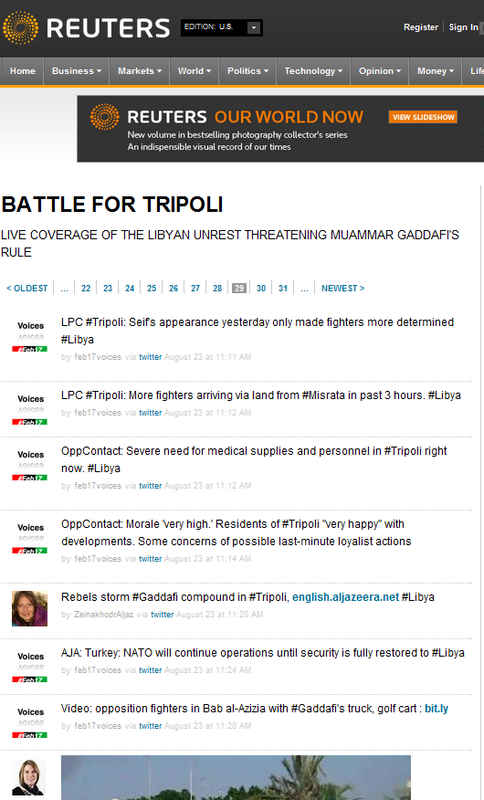 AlJazeera’s Libya Live Blog) as events were developing. Some organizations went a step further, streaming the feed as it was tweeted. Several brave men who spoke to the press, and me, lost their lives during the fighting in Libya. *Twiturm’s stability issues (it appears to be offline, scheduled to return in September 2011) led me to the audio sharing service Audioboo. It has been very stable. The feb17voices audio is here. We are working on an audio archive for the @jan25voices material. **In the first days, the rapid volunteer translators at @alivein also posted textual translations of some of our Arabic calls. Last updated: Wednesday July 27th 2012.